Hope that you and your loved ones had a fantastic Grandparents' Day yesterday! Here on Connie's blog, the celebrations continue for a fourth fabulous day. 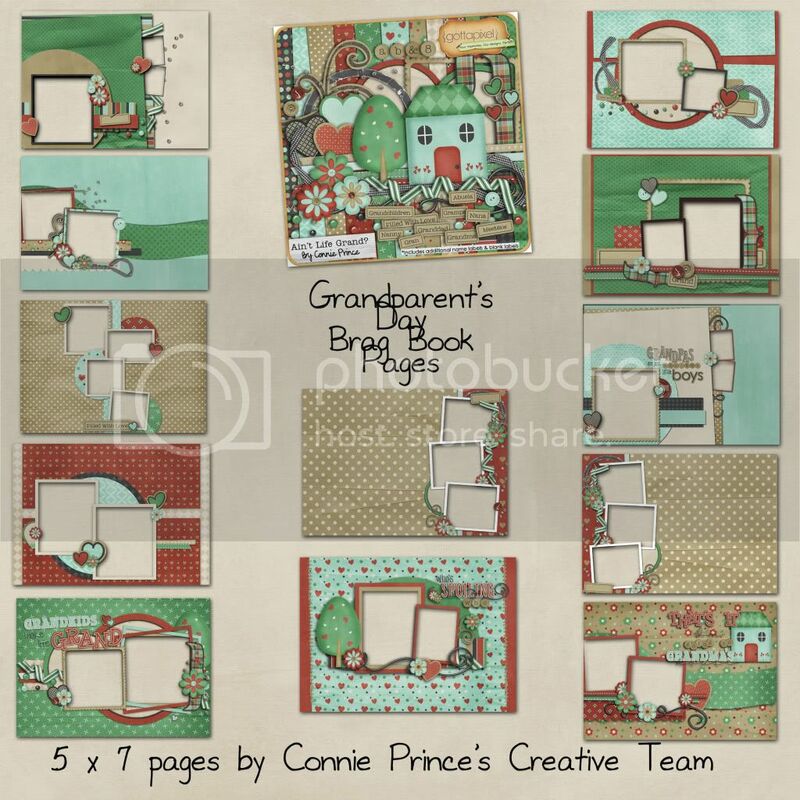 Today, we've got the final set of Ain't Life Grand brag book pages made with love by Connie's CT for you. I hope that you've been enjoying this weekend of freebie MADNESS! Please leave some love for Connie and the girls if you download - they really appreciate reading your comments. I'll be back tomorrow with your regularly scheduled daily freebies - we've got some more $1 sale kits to highlight before Connie's big retiring items sale at Gotta Pixel ends on Wednesday. Love all the pages! Thank you all so much. Thank you so much for this post. I want to let you know that I posted a link to your blog in CBH Digital Scrapbooking Freebies, under the Page 6 post on Sep. 13, 2010. Thanks again. Big hugs and thank you!!! Thank you all. What a wonderful gift! This is really cute! But how do you download it? Every time I click your link, I get taken to a DL page that only takes me further to weird links...? Thanks! Lovely gift !! Thanks so much !! To anon, you have to click on "regular download", then scroll down to the file name on the next page (ex. "Grandparents Day BB Pages 3.zip") and click that to download. It is slow and you can only download one file at a time but this set is free and adorable so it's worth it! Thanks so much for the brag book. You are so kind.